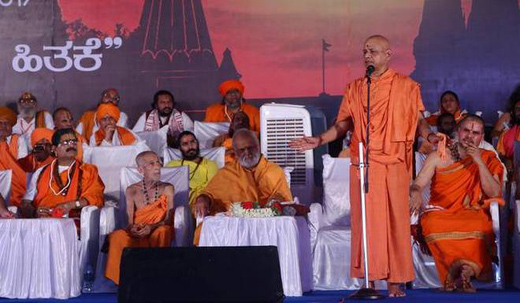 Udupi, Nov 27, 2017 : Cow protection took centrestage on the last day of the Dharma Sansad organised by the Vishwa Hindu Parishad (VHP) here, with resolutions passed on a uniform ban on cattle slaughter across the country, preparation of a dossier on cow thieves, and creation of awareness on ‘panchagavya medicine’. Nearly 2,000 sadhus and sants from attended the three-day event. Briefing mediapersons, Surendra Kumar Jain, joint general secretary of the VHP, said that though there were anti-cow slaughter laws in many States, they were being violated. The Sansad condemned cow slaughter and sale of beef in some States, including Kerala, West Bengal, Tamil Nadu and Mizoram. He said that in order to prevent the export of cow meat, there should be strict checking at the points of export. Heavy penalties and jail sentences should be imposed on violators and their export licences cancelled, he said. Mr. Jain claimed that it has been scientifically proved that cow urine and dung have medicinal properties that would not only help agriculture, but also the human body. Awareness should be spread on improving dairy farming and promoting cow-based agriculture , he said. On cow vigilantism, he said the Centre had recently issued an order to the States to prepare dossiers of ‘gau rakshaks’. Instead, he said, a dossier should be prepared on cow thieves and cow smugglers. Permits issued for cattle transportation should be computerised, Mr. Jain added.